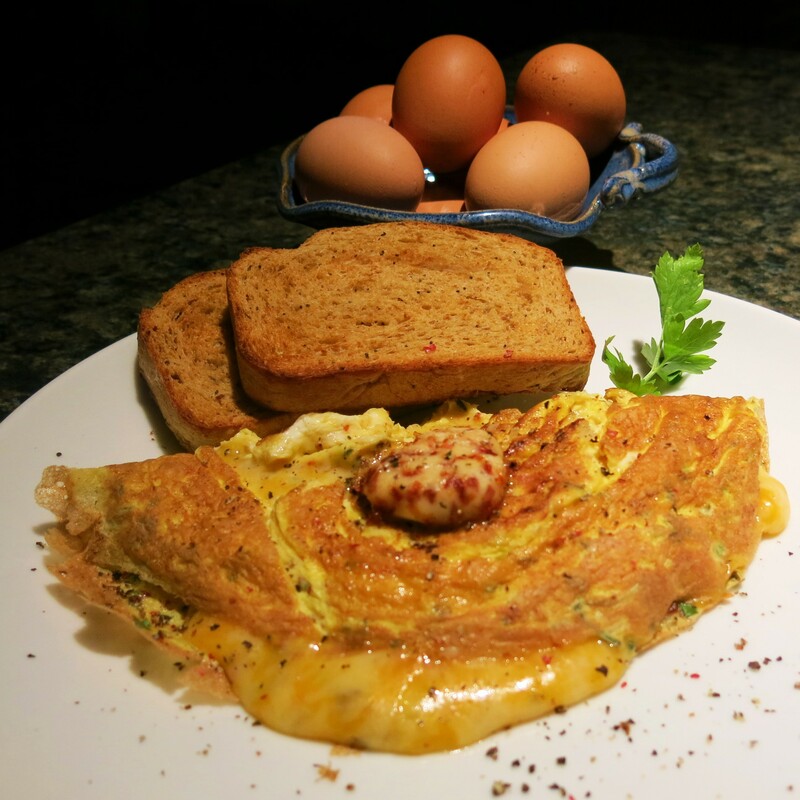 Omelets, or omelettes, are a great quick breakfast, lunch, dinner or late night snack option. Okay, so anytime is good! They are quick to prepare, can use up leftovers and they can be finished and on the table, within 20 minutes after you step in the door. 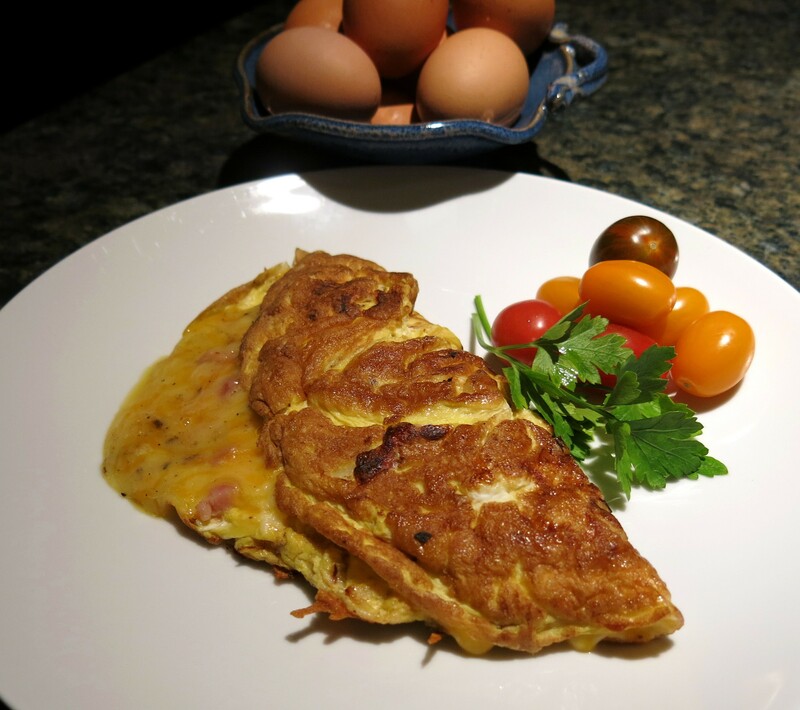 You have choices…a 2 egg or 3 egg omelet. This depends on the size of the pan you’re using. 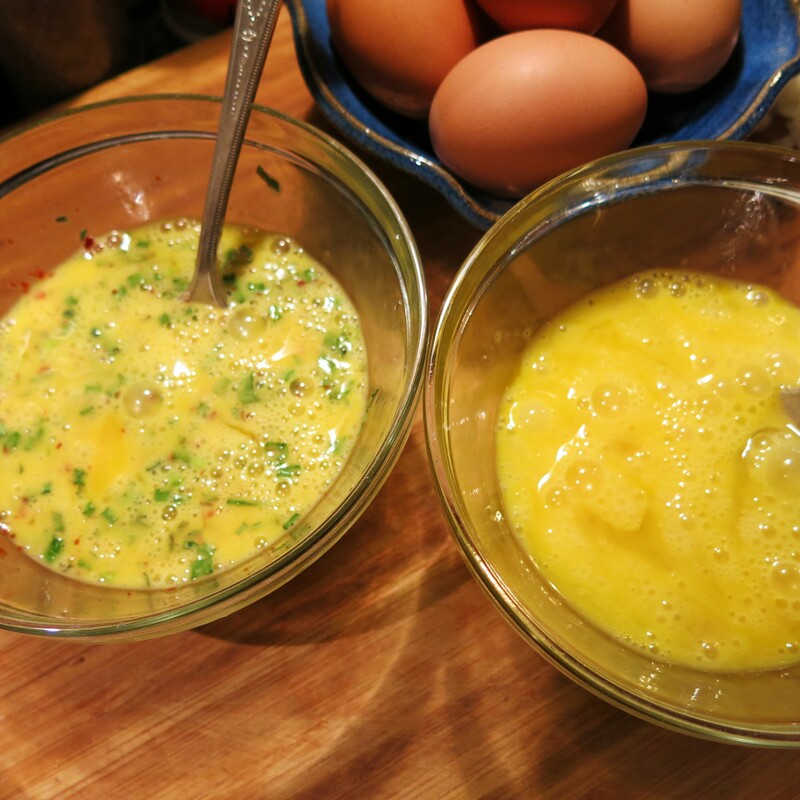 A 2 egg omelet works well in an 8-inch pan, while the 3 egg omelet works best in a 10-inch pan. The below recipe is for a 2 egg omelet. I don’t use a non-stick skillet, but do so if you wish. I use aluminum or anodized aluminum skillets. I wash them only with water, as you would a cast iron skillet. Using dish soap will destroy the microscopic film that keeps these pans “seasoned” so food won’t stick to them, therefore they are non-stick, but not in the conventional vernacular. Next you want to beat those eggs. Not just slurry them around a little…you want them to become one with each other…very Zen-like. In other words, beat the living Hell out of them. Now take a moment to catch your breath before we go on. By the way, these eggs shown here are about half-way to their final Zen-like state. Some recipes will tell you to add milk or water to your eggs. The steam from the water makes the omelet fluffier, but it truly isn’t necessary to add any liquid to the eggs…just let the eggs be what they are…delicious! Heat butter in an 8-inch non-stick skillet over medium-low heat. Beat eggs well, put some wrist action into it. 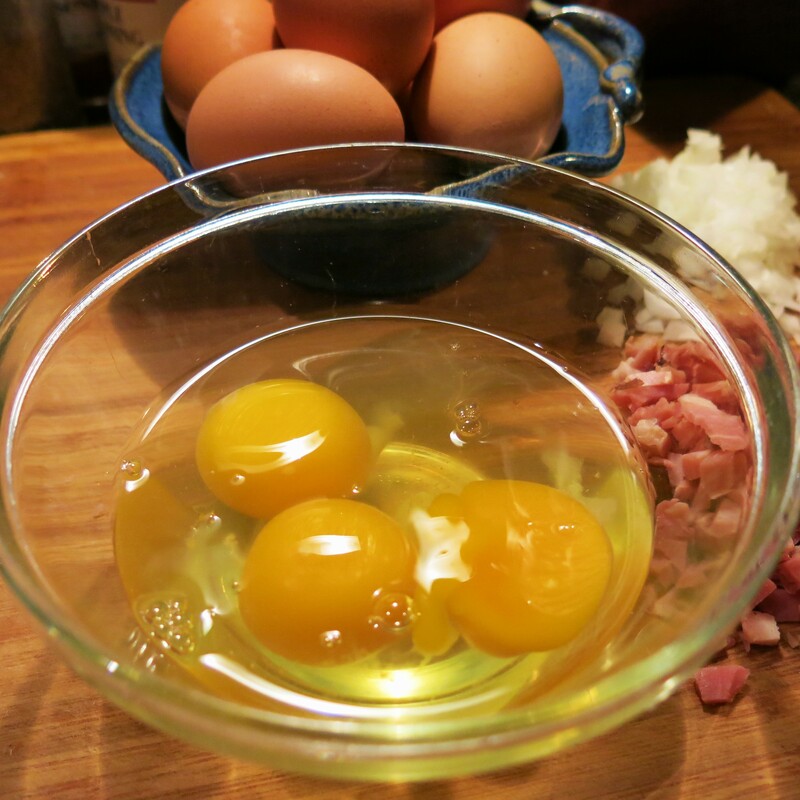 You want these eggs to be light and completely blended. Add a good pinch of salt and some grindings of pepper. Add a pinch of cayenne, if you want a little tongue tickle. Pour the beaten eggs into the skillet and cook, stirring gently with a wood chopstick, until eggs are lightly scrambled and almost cooked, about 2-3 minutes. Gently swirl the pan to allow the remaining raw egg to spread to the edge of the pan. 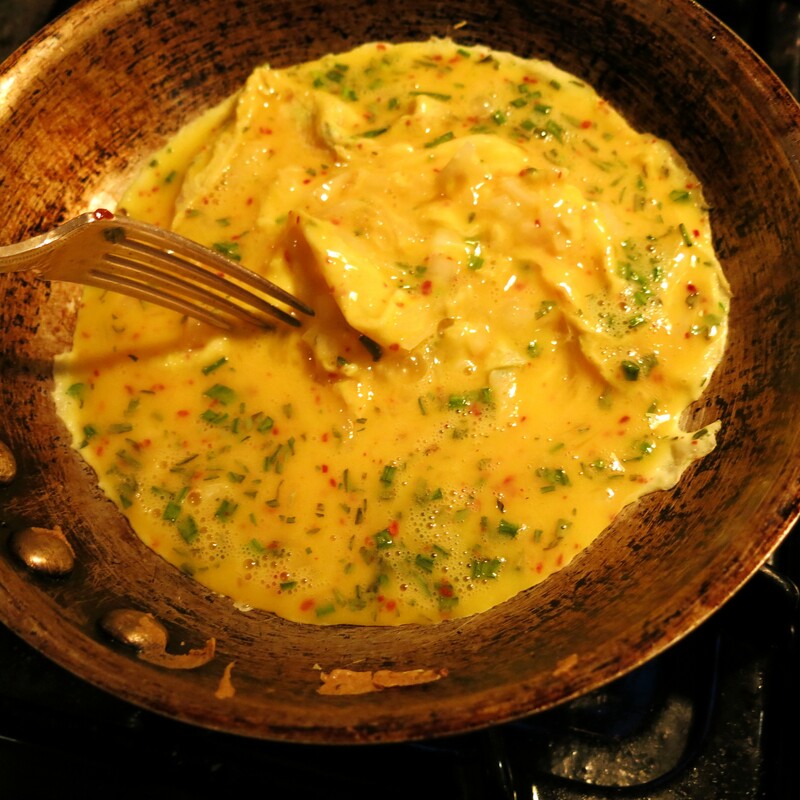 Using wooden (or silicon) spatula, fold up one-third of omelet. 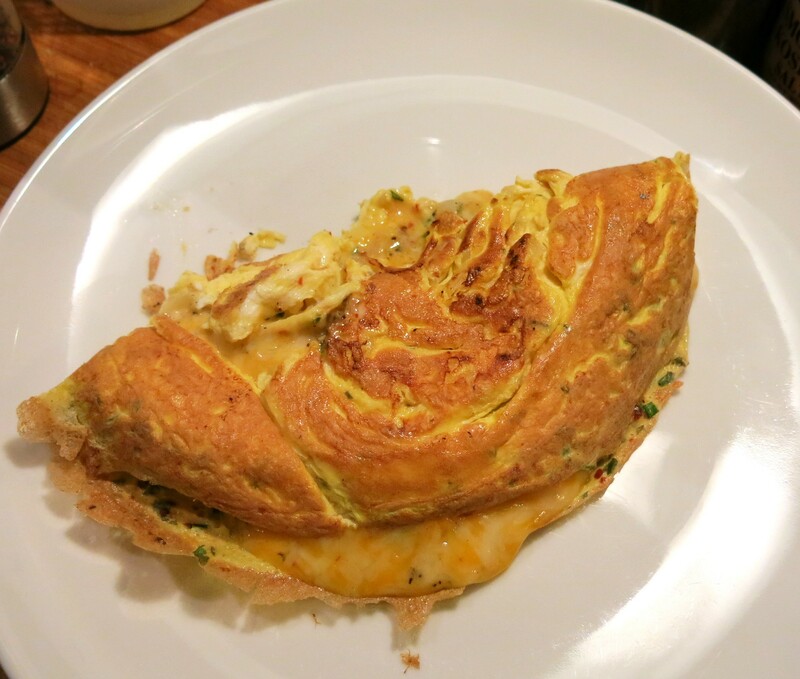 Roll omelet over onto itself, then slide omelet onto a plate. 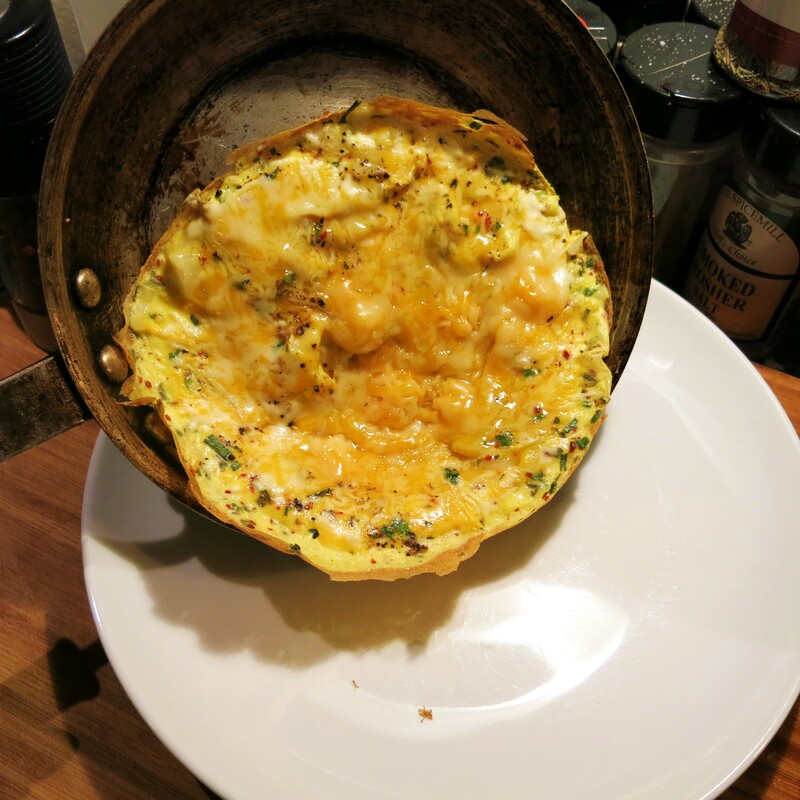 You may also slide the omelet partially onto the plate, then using the pan as a “spatula”, flop the top half over the bottom half making a half-moon shape. Serve immediately with good toast or croissants. then you rotate the pan, allowing the still uncooked portion to run down and around the edges of the pan. Then you leave it until the mixture is almost set. 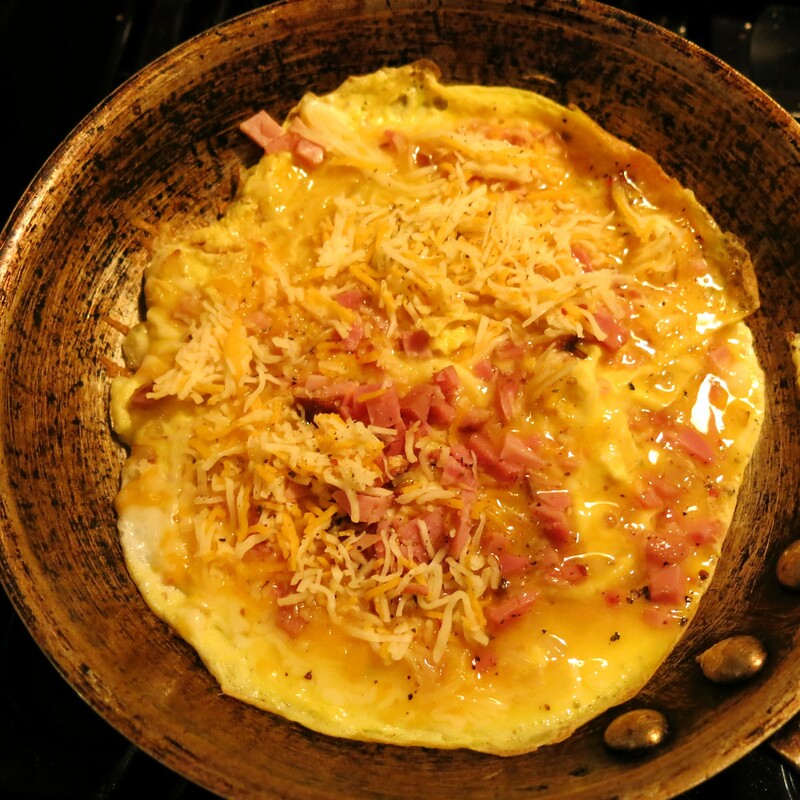 Toss in your filling ingredients and I usually flop the omelet into a half-moon shape. 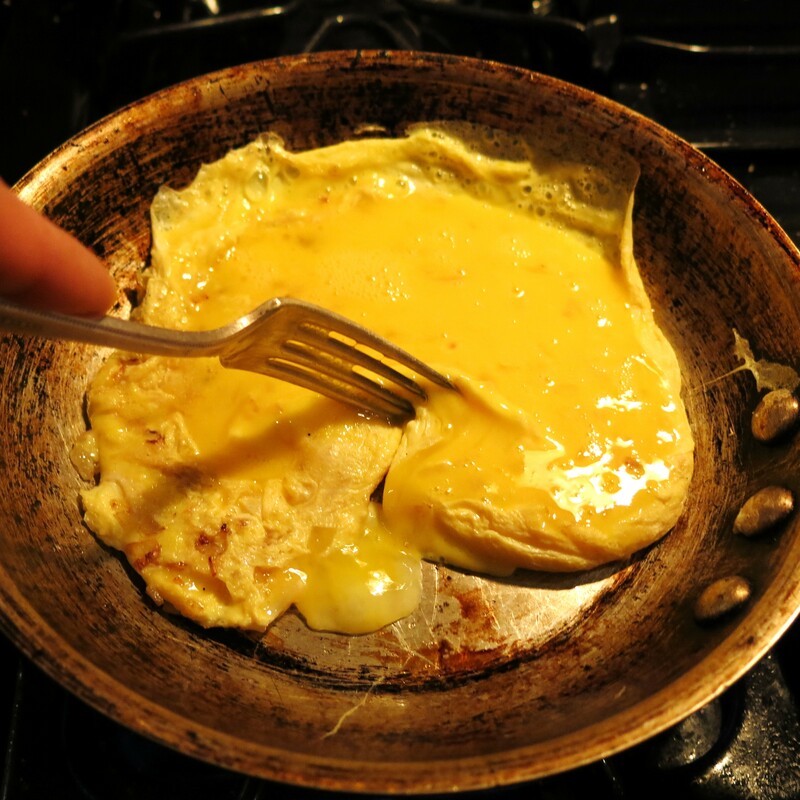 When the omelet is partially out of the pan, like in the picture, simply use the pan itself, like a spatula, gently flopping the top half over the bottom half into that half-moon shape. Look at that cheese oozing out the bottom edge. Get a fork now! You may add what ever you wish to make your omelet. But I caution you, don’t overfill an omelet; you want the taste of the eggs to be the star of the show and let the other flavors be the back-up band. I usually add cheese, no matter what else I use. It’s cheese for Goddess-sake and we love cheese. Parmesan, Swiss, Fontina and cheddar are all good options. Bits of cooked ham or bacon can be a nice addition. Add some chopped fresh herbs—chives, dill, mint, basil or pesto all work well. If using mushrooms, sauté them first, as well as onions, peppers, sausage, etc. Remember, with omelets, less is best. This may be the only time you ever hear The Goddess say that!